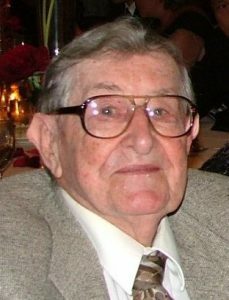 Michael E. Rovnak, 96, formerly of Hopewell, entered peacefully into eternal life on August 20, 2018 at the Tidewell Hospice in Sarasota, Fla.
Michael was born on May 7, 1922, in West Aliquippa, son of the late Steve and Anna Dulay Rovnak. As a young man Michael joined the Civilian Conservation Corps in New Mexico during the Great Depression. During the Second World War, Michael volunteered with Bombing Squadron 341 of the United States Marine Corps, proudly serving as an airplane mechanic in the South Pacific before returning home to West Aliquippa. He spent the duration of his 44-year career as a millwright working for the Jones & Laughlin Steel Company, before his retirement in 1984. Michael was a member of St. Titus Catholic Church in Aliquippa. He was married to his loving wife, the late Mary (Fenchak) Rovnak, for 69 years, and together they raised seven children. Michael was actively involved in the Holy Name Society at St. Titus and greatly enjoyed Pittsburgh sports, Slovak cultural events, tending to his garden, attending Marine reunions, and spending time with his children and grandchildren. Michael will be remembered dearly by those who knew and loved him. The son of Slovak immigrants, he embodied the American Dream in every sense, working his entire life to ensure the security and prosperity of both his family and his country. Michael and his wife Mary worked tirelessly to ensure that their children and grandchildren were surrounded by love and opportunity, and his family is grateful for the sacrifices that Michael made on behalf of his family. In addition to his parents, Michael was preceded in death by his wife, Mary; his brothers George, Steven and John; his sisters, Anna Olexa and Margaret Galzarano; and his grandson, Matthew Adams. He is survived by his sister, Mary Montini, Aliquippa; brother-in-law Michael Fenchak (Pam), Windsor, Ontario, Canada, sons Michael Rovnak (Cora) of Ft. Myers, Fla, Thomas Rovnak (Cynthia) of Palmetto, Fla., Paul Rovnak (Robin) of Lancaster, Pa., and Robert Rovnak (Cynthia) of Sarasota, Fla.; daughters Mary Anne Adams-Turka (John) of Sarasota, Fla., Patricia Patchell (Edward) of Sarasota., Fla., and Susan Rovnak of Baltimore; ten grandchildren, two great-granddaughters, and numerous nieces and nephews. Mass of Christian burial will be celebrated at 10AM on Saturday, August 25 in St. Titus Catholic Church, Aliquippa, with the Rev. Thomas Wilson presiding. Burial will follow at Mount Olivet Cemetery, Hopewell Twp. where the US Marines and the Beaver County Special Unit will render Military honors. Memorial contributions can be made to St. Titus Catholic Church, 952 Franklin Ave., Aliquippa, Pa. 15001 and Tidewell Hospice, 5955 Rand Blvd., Sarasota, Fla. 34238.